End of the weekend. A sweet one, full of friends, that left the kitchen a disaster. Everyone’s gone, kids are sleeping, we’re talking in the kitchen. I’m eating sweet potato fries. Cold. Off a cookie sheet. Casually at first–there are only a few left, it seems easier than putting them away. I absent-mindedly take another, wonder if we could just clean up next weekend instead. (Is that soon?) Then I give the tray my full attention to peel up the last sticky, crispy, sugary bits of sweet potato. No wonder my kids love these. If your kids don’t get to them first, you’ll be glad to have these roasted sweet potato fries alongside a burger or sandwich of any sort, for an afternoon snack, or topping an untraditional soba or sushi rice bowl. Or maybe, like me, you’ll find yourself eating them cold from the pan as dessert. 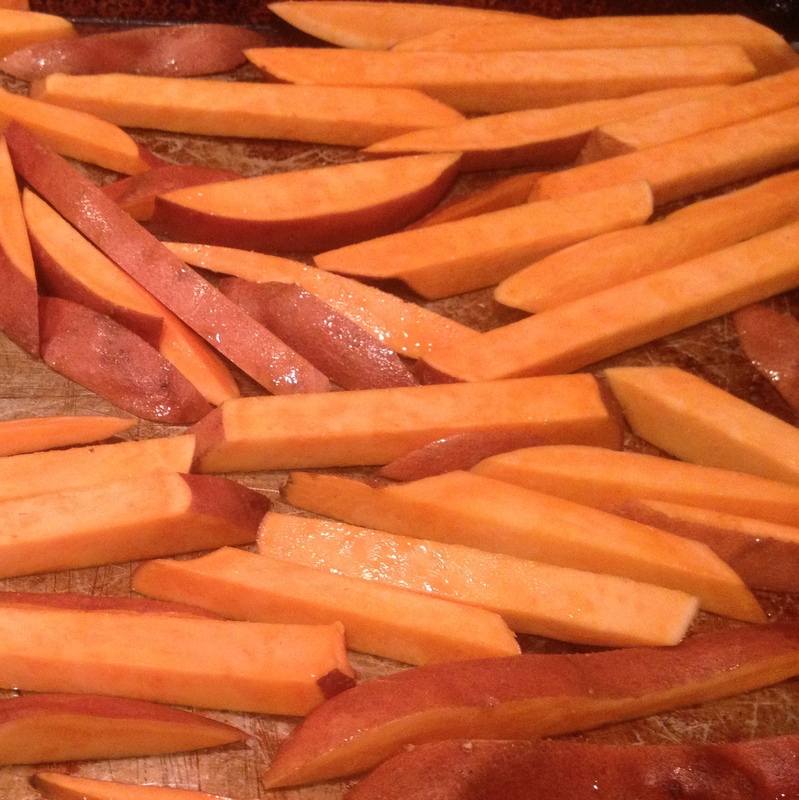 Baked Sweet Potato Fries: Cut sweet potatoes into batons of any size. Place on a baking sheet and toss with olive oil and salt. Roast at 450, checking every 10 minutes and turning them as they start to brown. Remove when edges are crisp; smaller fries may be done before larger ones. Total baking time depends on how thickly the sweet potatoes are cut. Serve with ketchup, or maybe a garlicky aioli. This entry was posted in DIY, Feeding Kids, Snacks and Apps, Vegan or Would-Be-Just-As-Good-Vegan, Vegetables By Themselves and tagged children, cooking, DIY, family, food, homemade, kids, lifestyle, recipes, vegan, vegetarian on March 4, 2012 by emmycooks. I make these all the time — except I’m lazy, so I usually just cut them crosswise into disks. Sometimes I sprinkle a little smoked paprika on them before putting them in the oven. Oh, I bet these would be GREAT with smoked paprika. Thanks for the idea! I loved these when they first came on the market and knew I would want to make my own at some point, so thanks for this post. I’m wondering if they might also be done in a deep fryer, that double fry method that works so well for regular potatoes. I would suspect times and temps would need adjustment considering the higher sugar content and perhaps less water. Trick would be to watch and take notes. I have no deep-frying expertise as a cook, although as an eater I can say that I have always enjoyed the actually-fried sweet potato fries I’ve had at restaurants! 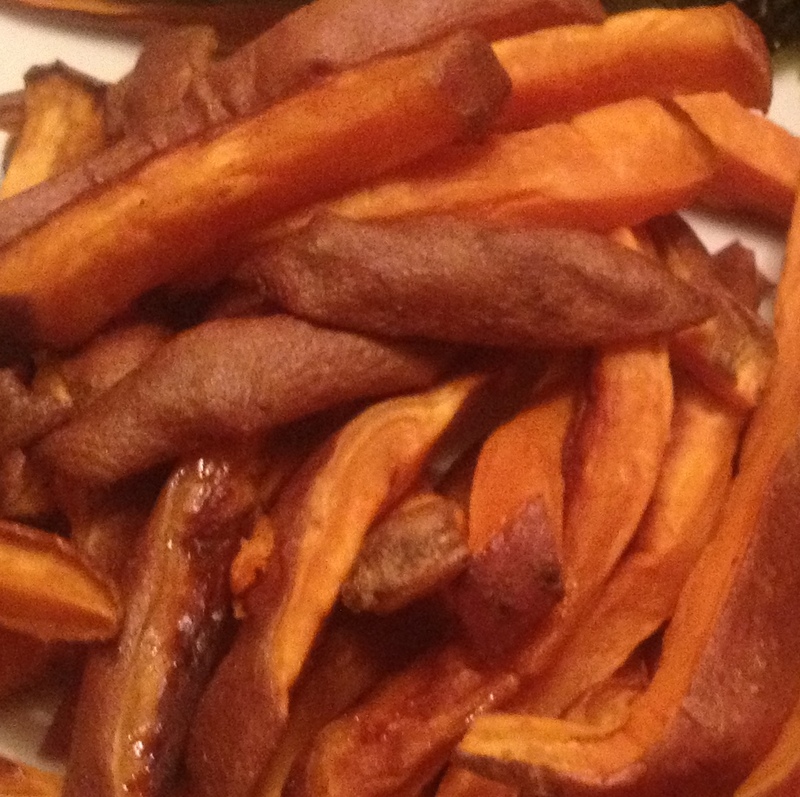 Baked sweet potato fries are my favorite! I always undercook them (on accident) but they are delicious nontheless. It’s hard to wait when you know how delicious they’re going to be! But I do think they’re amazing when you let the edges get nice and crispy-caramelized. Those are the best weekends, when the kitchen is a disaster. I agree! I love roasted sweet potato fries too! Sometimes I slice them into circles and coat them with a mixture of sugar, chili powder and salt! The sugar helps them to caramelize even more and the chili powder takes the egde off the sweetness. I mix up about 2 tablespoons sugar, 2 tablespoons chili powder and 1 teaspoon salt. I just keep it in a jar and sprinkle a bit on the potatoes after they have been oiled.